Stumped about where to head for the holidays with your pets in tow? TPG Contributor Lane Nieset has done the research to highlight nine hotel brands — and individual properties within them — that welcome you, your loyalty points and your furry friends. Kimpton’s Surfcomber South Beach welcomes all sorts of animals — and offers the brand’s signature pet amenities free of charge. Photo courtesy of the hotel. At Kimpton’s 30-plus hotels throughout the US, pets are welcomed free of charge, no matter what size, shape or breed. Even better, there’s no limit on the number of furry friends you can bring along. The lobby of each Kimpton features water bowls and treats, and stays come with complimentary in-room loaner items such as mats, food and water bowls, as well as courtesy bags for picking up after your dog and an invitation for him or her to join the complimentary nightly wine hour. 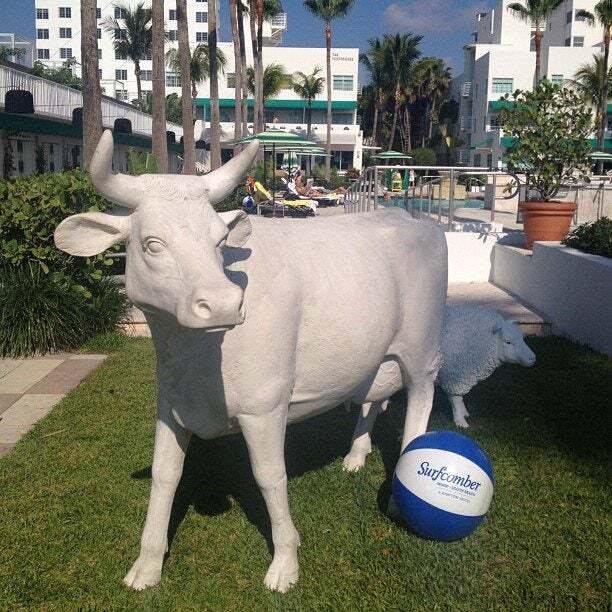 One of the most ideal Kimpton properties for a trip with Fido is Surfcomber South Beach, a 186-room hotel nestled on Collins Avenue with oceanfront access and Art Deco-style rooms. The hotel is also near dog-friendly restaurants on South Beach, including the Florida Cookery at The Royal Palm, a locally focused spot featuring Florida-inspired specialties like homemade conch fritters. Rates at the Surfcomber start at $169 per night in winter. If you want to jet off to the Caribbean for the winter, you’re in luck. Kimpton’s newer Seafire Resort + Spa is the first boutique resort on Grand Cayman’s Seven Mile Beach. The 266-room hotel features a mix of modern oceanview suites and roomy beachfront bungalows that are perfect for families, as well as pets. Of course the highlight here is the water, and travelers can opt to sit poolside cocktail in hand or head right down to the sea, lounging in one of the complimentary beach chairs. Rates in winter start at $509 per night. In early 2018, the Karma Rewards program will merge with IHG Rewards Club to become a single rewards point system, so you can now earn IHG points on your Kimpton stays and score free nights at any of IHG’s 12 global brands. Karma Rewards fans can still look forward to some of the program’s perks, such as Inner Circle benefits, $30 spa credits, invites to special events and Raid the Mini Bar cards. At Moxy Times Square, dogs aren’t confined to your quarters; pups under 20 pounds are welcome in the lounge and Bar Moxy. Photo courtesy of the hotel. Domestic pets are welcome at all of Marriott’s millennial-focused Moxy Hotels, but certain properties offer additional pet amenities. The 612-room Moxy Times Square is not only one of New York City’s newest hotels, it also sports one of the brand’s best pet programs. Housed in the historic Mills Hotel, which dates back to 1906, Moxy Times Square marks the 15th in the chain and just so happens to feature one of the city’s most breathtaking rooftop bars (complete with a golden carousel and mini putt-putt course). When you check in, you’ll also receive a warm greeting from seven-month-old Stella (posing in the photo above), who reigns as the resident house pup and is one of the friendliest receptionists in town. While many New York City hotels limit pets to guestrooms, dogs here are just as welcome to join for drinks at the Moxy Bar and lounge as their owners are. Pups under 20 pounds can stay the night for a non-refundable fee of $75 per day (with a limit of one dog per room). Even better, the hotel offers a House Pet package starting at $249, which includes branded swag like bowls and blankets that are yours to keep following the stay. Apart from the package, rates at the Category 8 Marriott start at $158 or 40,000 Rewards Points per night. 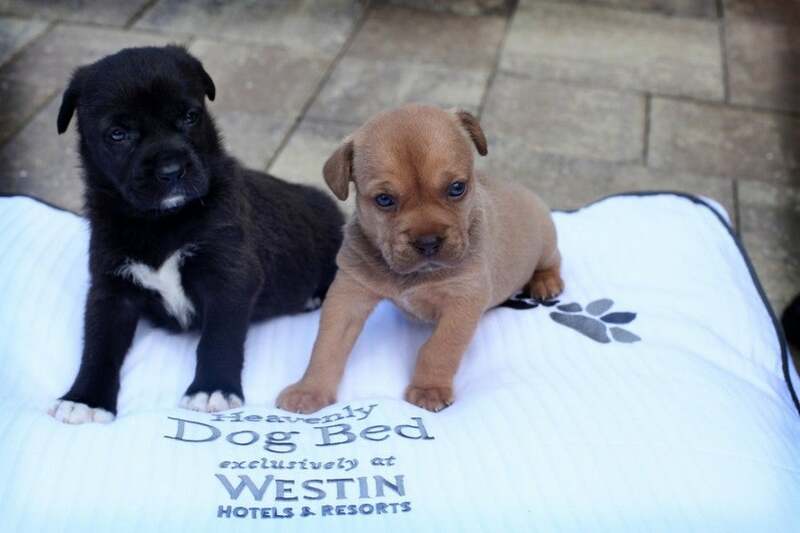 At all Westin properties — including The Westin La Paloma in Tucson — your pet gets its own Westin Heavenly Dog Bed. Photo courtesy of Westin La Paloma Resort & Spa. Most Westin Hotels & Resorts are dog-friendly, offering pet beds, floor mats, food bowls, ID tags and a welcome kit at check-in with info on doggy hotspots in the area. The weight limit is usually 40 pounds (but management may make an exception if you clear it in advance) and some properties may ask for a deposit or pet fee. 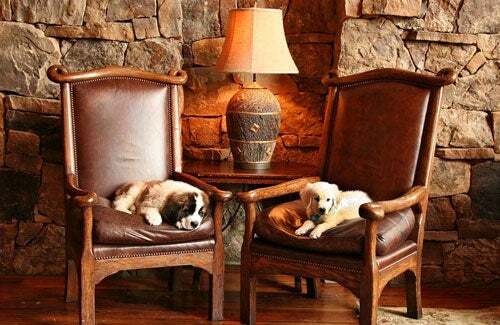 At The Westin La Paloma Resort & Spa, tucked under the foothills of Tucson, Arizona‘s Santa Catalina Mountains, your furry companion will receive a VIP greeting on arrival and have its very own Westin Heavenly Dog Bed, a pet-sized version of the brand’s signature sleeper. Dogs up to 40 pounds stay free and receive amenities like treats, water bowls, toys and a refillable bone-shaped waste bag. While Fido is getting star treatment, you can pamper yourself a bit, too, taking a dip in the five-pool oasis or playing a round at the 27-hole Jack Nicklaus golf course. Rates for the SPG Category 4 property start at $135 per night or 10,000 Starpoints for a free night. While staying at the hotel, your furry friend unfortunately won’t be allowed at the pool, restaurants or Red Door Salon & Spa. W’s P.A.W. program comes with everything your dog needs for a chic stay. Photo courtesy of W Hotels. The W brand’s P.A.W. (Pets Are Welcome) program allows you to bring one pet per room, said pet must weigh 40 pounds or less, and you’ll be charged a $25 pet fee and $100 non-refundable cleaning fee. For these fees, your suite will be complete with a pet toy and treat, W Hotels pet tag, W pet bed, food and water bowls, and a pet-in-room sign to hang on your door. Pet-friendly guestrooms even include a pet turndown gift. Any property’s concierge can help you find grooming, dog-walking and -sitting services, as well as offer advice on nearby dog park and runs, and the front desk will have on-hand leashes, toys, treats, wee pads and litter boxes. For those looking to skip over to the West Coast, one of our top picks is the 258-room W Los Angeles-West Beverly Hills, which underwent a locally controversial rebranding two years ago. This swanky property (with a sprawling backyard pool area, hopping bar and full spa) is actually set in the leafy, residential neighborhood of Westwood, about a half-mile from the western border of Beverly Hills. Regardless of this name shift, the hotel is definitely set near UCLA’s lawns and gardens — the perfect place for dog-walking — and just a 15-minute drive from Santa Monica, where the walking paths and pier are pet-friendly, but the sand and surf are not. Rates for the SPG Category 6 hotel start at $303 or 25,000 Starpoints per night. Most of Hyatt’s properties are dog-friendly, including the Park Hyatt Washington in DC. Photo courtesy of Hyatt. Featured across all Hyatt brands (e.g., Park Hyatt, Andaz, Hyatt Regency, HYATT, Grand Hyatt, etc. 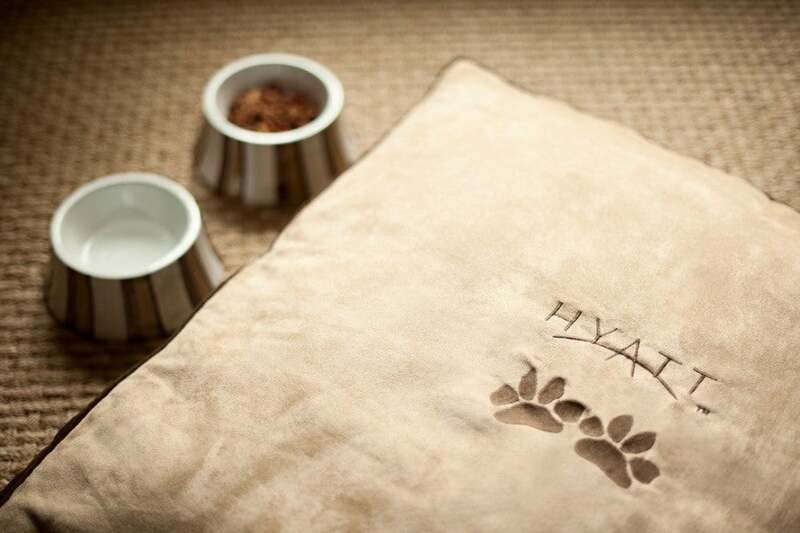 ), Hyatt’s pet program offers designated dog-walking areas with well-stocked clean-up stations; special ID tags; dog beds and bowls; and a welcome card and in-room amenity. Note that most Hyatts charge a non-refundable cleaning fee (which varies by hotel); weight restrictions dictate that dogs must be under 50 pounds, and if bringing two dogs, they must total 75 pounds or less. At the Park Hyatt Washington (where TPG stayed in 2011), dogs have access to most of the hotel’s public areas (except for the Guest House, lounge and Blue Duck Tavern). The property’s non-refundable $150 pet fee (a portion of which is donated to the Humane Rescue Alliance) ensures that your pooch will have everything he or she needs for a comfortable stay in Washington, DC. The concierge will even provide a list of recommended vets, doggie day care, and groomers in the area. Rates in winter start at $245 or 20,000 Hyatt Gold Passport points per night. In the Windy City, meanwhile, the Park Hyatt Chicago is home to its own resident pug, Parker, and donates the entire $100 pet fee to PAWS (Pets Are Worth Saving) Chicago, the city’s largest No Kill Animal Shelter. Before you arrive, housekeeping will ensure your pup receives a proper welcome with a pet bed, dog bowl and treats ready and waiting for your arrival. Rates start at $279 or 25,000 Hyatt points per night. The Sheraton New Orleans offers free stays for dogs under 40 pounds — and some swanky public areas, too. Photo courtesy of Sheraton. Similar to Westin’s pet policy, most Sheraton Hotels & Resorts are dog-friendly and offer the same amenities — welcome kit, pet beds, food bowls — but what’s even better about stays at some of these properties is that in general, the weight limit is one of the highest we’ve seen: 80 pounds. Cleaning fees and deposits vary from Sheraton to Sheraton, and while some may nix fees all together, the weight limit may be slightly lower. If you’re heading to the Big Easy, bring your pet along for a stay at the 1,110-room Sheraton New Orleans Hotel on Canal Street near the French Quarter. The hotel offers free stays for dogs under 40 pounds, which includes an in-suite Sheraton Signature Sleep Experience Dog Bed. You can take your dog (on a leash) throughout all of the public areas, and there’s even a Doggie Relief Area right next to the motor court. Rates at this SPG Category 4 hotel start at $182 or 10,000 Starpoints per night. Aloft Asheville Downtown is not only pet-friendly (cats included! ), it also houses foster rescue dogs. Photo courtesy of Aloft Asheville Downtown’s Facebook page. Marriott International’s Aloft Hotels are another one of its pet-friendly brands that rolls out the welcome mat for pets up to 40 pounds. During your stay, Fido can make use of the Animals R Fun (ARF) Program’s complimentary amenities like special beds, toys and treats, and you won’t have to worry about paying any sort of pet or cleaning fee. At the 115-room Aloft Asheville Downtown, both dogs and cats are welcome to stay free of charge and even receive their own goodie bag, complete with locally baked doggie cookies. Another puppy perk? You can walk pups on the hotel’s rooftop puppy path or take your pet to play in the nearby one-acre French Broad River Dog Park, which is free of charge and open during daylight hours. As if this isn’t enough of an incentive to stay, perhaps the hotel’s pet adoption program will have you swayed. For the past three years, the hotel has partnered with Charlie’s Angels Animal Rescue to house foster rescue dogs, helping them find the purr-fect home. Rates at the SPG Category 5 hotel start at $177 or 12,000 Starpoints per night. Dogs stay free at all Hotel Indigo properties — including Atlanta Midtown. Photo courtesy of Hotel Indigo. 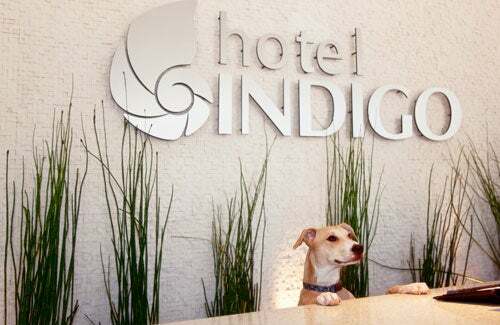 All of the hotels that are part of IHG’s budget-friendly Hotel Indigo brand are dog-friendly, offering amenities like water bowls and treats, with pet fees and weight restrictions varying by hotel. Hotel Indigo is such a fan of pups that some of its properties have adopted an on-site dog mascot that lives with a hotel’s manager, as in the case of Atlanta Midtown’s Jack Russell terrier, Indie. The 140-room Hotel Indigo Atlanta Midtown in Georgia, located across from the historic Fox Theatre, was the first of the brand to open in 2004. The hotel charges a $75 nonrefundable deposit, but pets of any size and weight are welcome to spend the night. The hotel’s neighborhood is prime for dog-walking along Peachtree Street or playing at the Piedmont Dog Park’s 1.5 leash-free acres. Travelers can also book the Ruff Life package (starting at $245 and including the $75 pet fee), which comes with a dog bed, bowl of treats and copy of Fido Friendly Magazine. 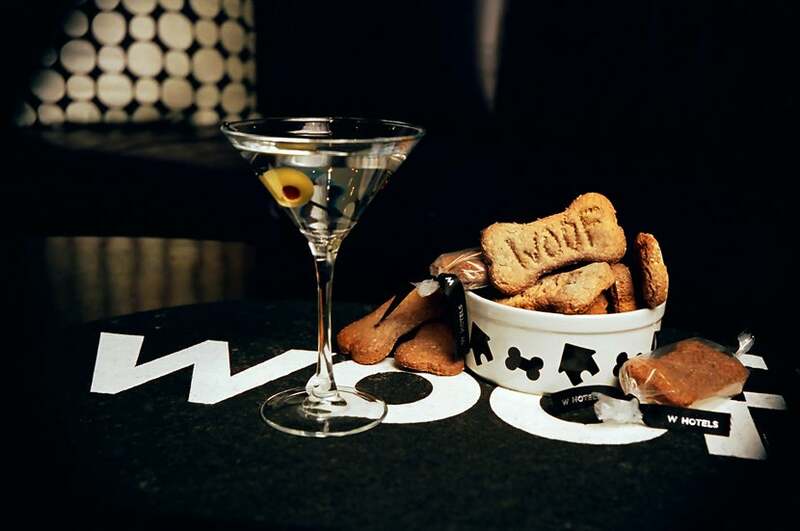 And for an extra dash of Southern hospitality, the hotel also hosts canine cocktail hours throughout the year at its on-site restaurant, 683 Midtown Bar & Bistro, which donates proceeds to the Atlanta Humane Society. Rates start at $216 or 30,000 IHG Rewards Club points. Dogs live the suite life at The Ritz-Carlton, San Francisco. Photo courtesy of The Ritz-Carlton. Not all Ritz-Carlton hotels cater to pets, but the ones that do really know how to go all-out and in the past have offered everything from 22-karat plated ID tags to in-room Burberry pet-size raincoats. Ritz-Carlton charges cleaning fees that range between $125-250, as well as a boarding fee at select properties. The hotels typically offer amenities like treats, toys, canine room service and spa treatments for dogs up to 30 pounds (although certain properties may have lower weight restrictions). At five-star The Ritz-Carlton, San Francisco, travelers can book the Suite Pampered Pooch package (rates from $849 per night, including pet cleaning fee) that starts with a VIP (Very Important Pooch) greeting at the door and includes personalized service, since the staff keeps guest recognition records for your pup knowing its name, breed, weight and preferences. Once at the hotel, dogs under 30 pounds receive an in-room dining menu, pet toy, framed bed, bowl, pet tag, and Pooch Pack with ideas for activities, walks and pet-friendly parks and beaches in the area. Only owners are allowed in the Club Lounge and restaurant Parallel 37, but they can carry pets through the lobby and into elevators (as long as they’re leashed). Outside of the package, owners pay a $125 non-refundable pet fee. Rates at the Tier 4 hotel start at $362 or 60,000 Ritz-Carlton Rewards points. What are some of your favorite pet-friendly hotels in the US?